The comfort zone of American cuisine is meat, potatoes, and a wee bit of vegetables. When it comes to whole grains, we are sadly lacking. Two readers are interested in something called "Wheatberry Salad". 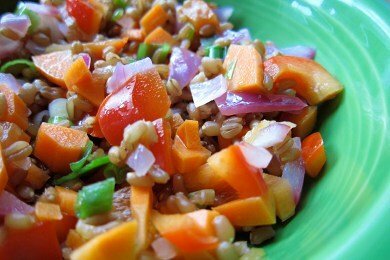 I would love to see an incredible recipe for Wheatberry Salad which can be a snack. Our local Shop Rite sells it in their deli, but I would much rather make my own. Eva's mother wants to make it, too! So, what is a Snack Girl to do but go hunt down some wheat berries? - a whole grain I have never tried. At my local Stop & Shop, the deli was like, "huh? wheat crappies salad?" - when I asked for wheat berry salad. The store manager was equally confused, but he found packaged wheat berries for me. I spent $3 for a pound and I was a bit FREAKED by having so many of them since I had never tried them before. But, I have good news! Wheat berries rock! If there was a match-up between barley, quinoa, and wheat berries, wheat berries would take them DOWN. Why do I like them? They lack the DIRT taste component that I don't like about other grains. They are nutty and have a lovely consistency (not gummy or crunchy) and I fell deeply in love with them. They are my new favorite whole grain - and I will pay you $1 to try them (not really). What is a wheat berry? The term wheat berry refers to the entire wheat kernel (except for the hull), comprising the bran, germ, and endosperm. You are getting all the nutrition from the wheat grain. This salad is a take on Ina Garten's wheat berry salad recipe. She uses the equivalent of 12 tablespoons of olive oil, and I felt that it would work with less. I did use one trick from her recipe and cook the onions. For some reason, I can't eat raw onions anymore (age? personality?) and I liked the idea of a sweeter onion taste that you can get from cooking them. You can skip this step, but I wouldn't. This is a great replacement for a macaroni salad at a BBQ. I designed the salad for eight servings because this keeps well in the fridge and is a fantastic lunch, breakfast, or snack. Have any of you made wheatberry salad? I LOVE this blog. I've only recently discovered it, but it's been so helpful and wonderful. Thank you! As the daughter of a wheat farmer....this cracks me up! Wheat berries..my dad would get a kick out of this. We farm girls have know about wheat berries a long time...my mom used to wash them at harvest time and keep some around to cook a casserole with meat and veggies in it during the winter! She also had an electric gridner and ground her wheat berries into flour and made the best whole wheat bread you would ever taste! I LOVE Wheat Berries! The first time I had them was actually on an Air France flight. There's just something about their wonderful taste! I like em with some steamed chopped veggies, chicken breast, and a red wine tomato sauce. Yum yum! Love the picture of the dish and love the new idea. 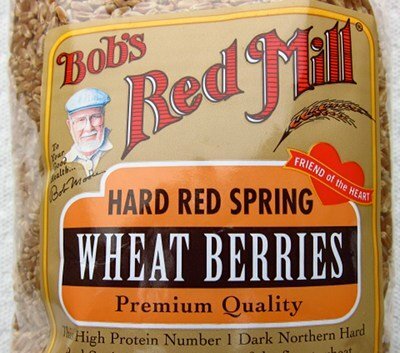 Bob's Red Mill is local to me, but I've never even heard of wheat berries. I feel a trip to the store in my very near future... and a new dish to serve up for BBQ'ing this weekend! Looks great, but I'll have to stick with quinoa and brown rice. I am gluten-free! This sounds delicious! I've never tried wheat berries either though I've seen them. My kids have been very receptive to trying new grains lately so I'm going to have to give this a try. Thanks! This dish looks fantastic. I'll surely be adding wheat berries to my grains repertoire! Sounds heavenly!! Can't wait to try it out!! And I thought wheat berries were just for grinding into flour to make bread with. THANKS! I have not tried the salad but my mom loves it so I want to thank you so much for this recipe. I am sure she will love it and she won't have to buy it from our grocery store deli section anymore. @Eva - please come back and tell us if she likes it! I couldn't find wheat berry at 2 stores (the grocery store didn't have it and the health food store was sold out) so I actually took this opportunity to try quinoa for the first time. I used that as the basis for the recipe instead. I also used red wine vinegar because I had it on hand. All substitutions aside, what a delicious recipe! The lemon and sauteed red onion really make it pop. I am smiling...I just brought up the site and low and behold there is a Wheatberry Salad. I ventured down to the co op today to find fresh dates and my organic spring mix of lettuce. I came home with the dates, lettuce and a Cranberry Wheatberry Salad. According to label on container it also has currants, pecans, cranberries and wheatberry. It also lists lime juice, maple syrup, cardamon and cloves. It was quite good. I have had different grain salads from that coop deli a number of times. All have been outstanding. The one thing I like is they use only organic products and use farmers in the area for most of the ingredients used. Seeing the recipe you posted is encouraging me to try and make a grain salad on my own next time. This sounds delicious! A couple friends of mine were talking about wheat berries last night at dinner. So happy you posted a recipe for your readers! Just made this with quinoa while I wait for my Wheat Berries to arrive from amazon. So delicious! Can't wait to try it with the wheat berries!! Trader Joe's used to have a Wheatberry Salad mix (found on the shelf) that included dried cranberries and nuts - those were an awesome texture sensation. I've not seen it for a while but you're inspiring me to replicate it! Just made this again with the wheat berries. They are AWESOME! Thanks for the recommendation! Loved this salad. I warm it a little and top it with a little chicken or boca burger and some BBQ sauce. I've been eating wheat berries for several years and love them! However, I'm interested in the fact that the farm gal above said her family already knew about them. My family grew lots of wheat, too, and when I mention wheat berries, they think I'm a hippie from the 60s. All these generations of farmers in my family and nobody knew! My mother used to boil whole wheat until tender then serve it with milk, honey or molasses, and milk. I like to use yogurt and cardamom with honey or dried fruit puree. Eat hot or cold. I like the look of this salad, but I have to reduce that much oil. Not sure what I will do, but I think I will try a little juice. Cooking Light has a Wheatberry Salad recipe with Pistachios and Goat Cheese. Google it, it has green onions for bite, honey and ginger for sweetness...it calls for cilantro, which I hate, so I use parsley....the salad is awesome...could eat it every day! Will try yours out, too! I'm wondering if your the same snack girl who blogs about ww simple start program?